Download ThinkOrSwim Paper Money and signup to demo trade with the professional trader tools from TD Ameritrade. Paper trading is available for free for 60 days for those without a funded TOS account, and is included for free with any funded account. Think Or Swim Paper Money includes all kinds of free indicators already installed and ready to use. You can also download and install premium indicators from SWIMdicators if you need some additional trading tools. ThinkOrSwim’s paperMoney demo trading platform includes almost all the same features as the main “real money” trading platform. The main difference is that in Paper Money the market data is delayed by about 20 minutes. So the latest bars on your chart will be older bars — they won’t be the real time current market data. Other than that, though, the platform is great, and it allows you to test almost any product, instrument, strategy, indicator, etc., just like in the real money program. Once you’ve perfected your strategy over a series of sample trades, now it’s time to logout of think-or-swim, switch over to “live trading,” and make some REAL money! To me, TDA’s most compelling features include that they have no minimum balance requirement, excellent free research and news tools, and a choice of three trading platforms (with my favorite, of course, being thinkorswim). I’ve also found their support teams to be extremely easy to reach via phone, email, or even live chat, and the reps seem friendly and accommodative. To pay for all the freebies and low fees that make Ameritrade so accessible to so wide an audience of investors, the firm has traditionally charged more in commissions than most other discount brokers. Recently at $9.95 per trade, the commissions were getting pretty out of sync with some of the competition out there for awhile, especially for more active traders. But the recent commission price cut to $6.95 per trade for stocks and ETFs has alleviated some of that imbalance. Traders have to realize the trade off is there due to the other free services the company provides, such as a good research and news, a pre-configured data feed, well-supported scriptable platforms, etc. — features which more specialized low-cost brokers charge customers for out of pocket. Still, even with the freebies and the recent price drop, TD may not be the best option for the more active traders among us. Account minimums: TD Ameritrade has a very accessible $0 account minimum for both IRAs and taxable brokerage accounts, so this can make it extremely easy for anyone to start investing. I mean, free is much, much lower than the typical $500 to $2,500 many brokerages want. Another nice add-on to the low account minimums is that TD doesn’t charge account inactivity fees either, and regardless of your balance you still get access to the free tools, news, and research. However, customers trading options or using margin are required to maintain at least a $2,000 account balance to be able to trade. Curated investments: TD Ameritrade has more than 100 commission-free ETFs and nearly 4,000 no-transaction-fee mutual funds. Moreover, Morningstar, an independent investment research firm, compiles a quarterly “Premier List” of no-transaction-fee mutual funds in 45 different fund categories for TD Ameritrade clients, and customers have free access to that. Free research: TD Ameritrade provides traders with analysis from Market Edge, S&P Capital IQ, and Credit Suisse, as well as free streaming CNBC news, market heat maps, and free real-time streaming quotes. Another little perk is the online social community myTrade. And if you want input from your local broker, there are over 100 locations around the U.S. that you can call or visit. Simulated trading: TDA offers some great ways for traders to get started without risking anything. Not only does it offer basic demo trading accounts, called TD Ameritrade Paper Money, but they also offer a fully functional version of their advanced trading platform on demo mode as well. 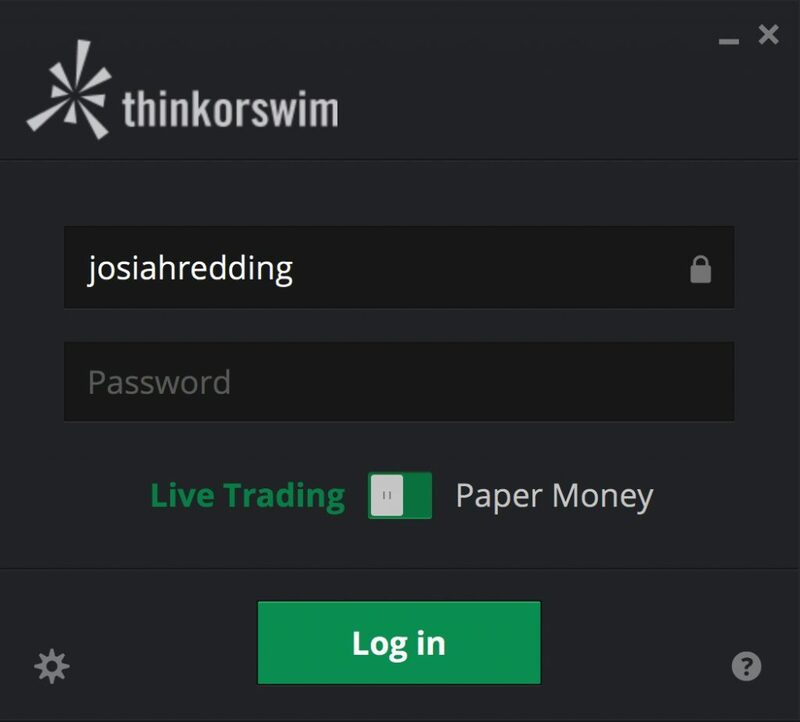 Just download and run the thinkorswim paperMoney platform. You can also demo trade right inside any of the mobile apps by switching the mode as you login. TD Ameritrade’s Platform Options: TDA has some great options for traders and investors, from your basic mobile app or online web-trading platform, to the more advanced Trade Architect, to the full-fledged all-in-one desktop trading platform thinkorswim. Trading commissions: Like I mentioned previously, my biggest gripe against TD Ameritrade has always been the commissions. That definitely got a whole lot better in March when the company lowered its base commission rate for stocks, ETFs, and options from $9.99 to $6.95. But the whole industry reduced commissions at about the same time, including Fidelity, Charles Schwab, and also TradeStation (a big competitor to thinkorswim), among others. This means that TD Ameritrade is still pricier than its peers, but again we have to remember that TDA offers a lot of freebies and lower minimums to offset some of that annoyance. TD Ameritrade does a good job of wearing a lot of hats and covering a lot of bases for different types of investors and traders. From getting portfolio guidance, independent research, commission-free ETFs, no-transaction-fee mutual funds, and your pick of three great multi-product trading platforms in addition to being accessible via the mobile app, they really check a lot of boxes. When you add to that that these features are all available for free and with no minimum initial deposit, TD’s service becomes a truly compelling offering. Beginner investors wanting low fees and minimums. Advanced traders who don’t want to deal with complex data feeds and software configuration.